Heroin is a synthetic opioid two to four times stronger than morphine. Because of heroin’s remarkable ability to dull pain, some people who chronically use the drug might not notice when they become ill. When people hear about sicknesses associated with heroin, most people think about HIV or hepatitis, two diseases that result from improperly sterilized needles; however, heroin itself can cause multiple diseases and infections, many of which affect the lungs. These lung complications are just as likely in people who inject heroin as people who smoke it. Heroin depresses the nervous system, which not only slows down brain functions, but also organ functions that the brain controls, such as the heart and lungs. Because the heroin user breathes too slowly, the lungs are unable to properly expel bacteria and fluid. Heroin users are often afflicted with the same lung diseases that affect people under anesthesia. Chronic heroin users run the risk of developing these serious lung conditions. Pulmonary edema is a life-threatening condition in which fluid fills the lungs. Chronic heroin users often develop this condition slowly, as each time they use the drug, a little more fluid gets caught in the lungs. Heroin users can also suffer from acute pulmonary edema (pulmonary edema that suddenly develops), usually during overdose. According to a report at NIH, 15 percent of heroin users who were hospitalized for an overdose also had acute pulmonary edema. In both long-term and acute cases, rapid treatment is necessary. Patients might need to have fluid sucked from their lungs, a process called aspiration. Patients might also be given diuretics or heart medications. In some cases, doctors will need to perform surgery to open the chest and directly remove the fluid from the lungs. Even with treatment, some cases of pulmonary edema are fatal. Empyema is a large amount of pus that collects in the space between the lungs and the chest wall. Because heroin is a cough suppressant, foreign matter is not easily dispelled from the lungs, which could result in an infection. Empyema is typically caused by these infections. Treatment for empyema often includes antibiotics to fight the underlying infection. Doctors might also use a chest tube to drain pus from the area in which it has collected. Most people recover from empyema. If empyema occurs concurrently with pneumonia, however, the risk of death or permanent lung damage increases. Heroin users have greater risk for contracting pneumonia than the general population. Pneumonia is an infection in either one or both lungs. Pneumonia can lead to other complications, such as empyema (a collection of pus inside the chest cavity), lung abscess, and dangerous amounts of bacteria in the bloodstream. 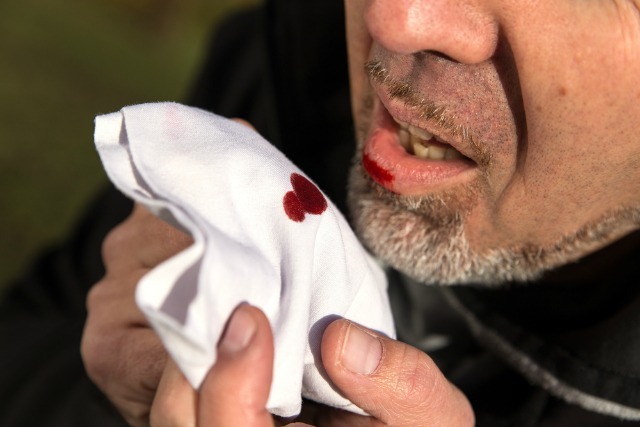 Some forms of pneumonia are not serious and can be treated at home; however, heroin users likely have weakened lungs and are more likely to suffer from complications. Treatment is usually accomplished via antibiotics. Bronchiectasis is a condition that can develop in heroin users after multiple infections damage the lungs and airways. With bronchiectasis, airways are scarred, widened and flabby. Over time, the airways can no longer properly clear themselves of mucus, allowing bacteria to flourish and another series of infections to occur. Bronchiectasis can also lead to respiratory failure if the airways are completely blocked. Bronchiectasis cannot be cured, but some medications might alleviate its effects. Some medications thin mucus, whereas others aid in emptying the airways via coughing. Doctors often administer antibiotics to fight the infections caused by bronchiectasis. Lung disease is very common in people who abuse heroin, but other complications can also arise, such as collapsed veins, arthritis, heart infections and liver disease. Heroin is not only risky because of its potential for overdose; even the most careful, precise addict can develop serious diseases that could ultimately result in death. No matter the reason why patients seek help for drug addiction, Sovereign Health Group is here for them. Sovereign Health uses natural, effective detox methods that soothe withdrawal symptoms and help patients take their first steps toward getting clean. To learn more, please contact 866-524-5504.